Fiction – paperback; Peirene Press; 144 pages; 2011. Translated from the German by Anthea Bell. Review copy courtesy of the publisher. What happens when we die? Do we truly know the people to whom we are closest? 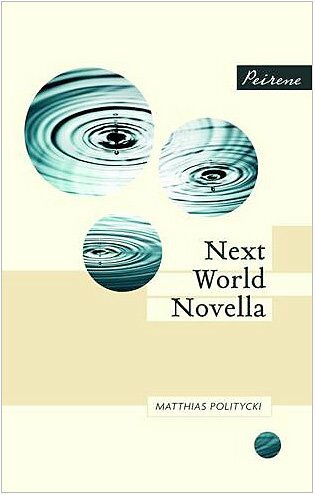 These compelling questions form the heart of Matthias Politycki’s Next World Novella, the fourth volume brought to us by Peirene Press, the London-based publisher which specialises in short works of translated fiction. The story opens with Hinrich Schepp, a 60-year-old Sinologist, sneaking up on his wife, Doro, who is sitting at a desk in a sun-filled room. He plans to kiss her on the neck — “stealing up quietly like a man newly in love” — before he realises that something is not quite right. There’s a funny smell in the room, “as if Doro had forgotten to change the water for the flowers”, and objects on the desk — a fountain pen, a glass of water — have been dislodged from their normal positions. He thinks Doro is asleep, but when he sees her face — “her features relaxed, entirely at peace, her skin grey” — he realises she is dead. As if that is not shocking enough, he notices that Doro has been editing the manuscript of a novel he began to write many years ago but had abandoned. While he had not told her about the novel’s existence, he had never deliberately concealed it, he had “just forgotten when he last had it in his hands”. He is somewhat alarmed to see that Doro had been scribbling meticulous notes, in her neat familiar handwriting, all over the typewritten pages. The note are deeply personal; some accuse him of infidelity. This sets Schepp (as he is called throughout the novel) on a fraught emotional journey into the interior reaches of his memory — and his heart. Had Doro always thought this badly of him? And if she really thought he was a cheat, why had she never confronted him about it? Was she a coward? As ever there are always two sides to every story, and Matthias demonstrates this by undercutting Schepp’s ever-changing reaction to Doro’s death — he wavers between disbelief, anger and regret, in the space of a few hours — with segments of the actual manuscript Doro had been secretly editing. Further on, we get to read about Doro’s secret life revealed in a letter addressed to Schepp, and once again their whole relationship is turned on its head. Who was this woman Schepp had married? Did he even know the first thing about her? How had they grown so far apart without him even realising? As an aside, I had the pleasure of meeting, and chatting to, the author at a Peirene Experience in early March. The event was staged in the central London shop of bookshelf designer Visoe. Guests were treated to a glass of wine, while the actor Jack Ellis did an appropriately dramatic reading from Next World Novella. Afterwards, Matthias took questions from the floor, before mingling with guests and signing books. 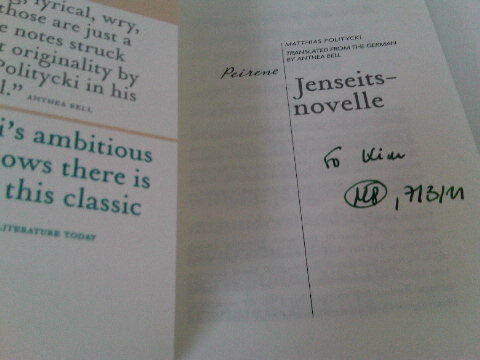 He was a delightful man, witty and self-deprecating, and was very happy to sign my book for me (see right). I just got my copy of the Delius book (in the original German), and I may try to get this one too if I’m feeling ambitious as it sounds very interesting :). This is such a great book! I really enjoyed the suspense that was set up, even after we know that she’s dead. Big life questions taking place in that little room. Lovely read! Impressed you’re going to read Delius in German… I have very fond memories of that book. Thanks for your comment, Amy. I think this is one of those novels that would stand-up to repeated reading, and you’d get something new out of it each time. There were so many bits that I didn’t even mention here — Doro obsessively worrying about what it is like to die, Schepp’s eye operation that makes him see life in a whole new light, etc.